There are four North American teams registered this year in the world's largest relay race - Jukola. At 23:00 Finland time (13:00 PDT, 16:00 EDT) on Saturday, June 18, there will be a mass start of 1717 teams, running seven legs each through the night. If you want to follow the action, go to http://www.jukola.com/2016/en/live/. The two Canadian teams are from Ottawa (team #380) and the Yukon (team #384). 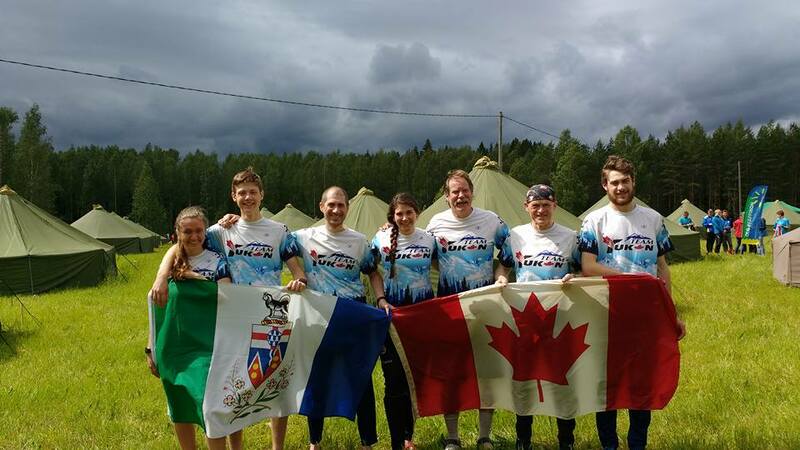 Here is the Yukon team, in running order from left to right: Pia Blake, Leif Blake, Forest Pearson, Jennifer MacKeigan, Ross Burnett, Svante Larsson, and Caelan McLean. Go Yukon! Other teams to watch are the two US teams: Cambridge (team 230) and the US Junior Team (team 1701). Earlier today, the all-woman Venla relay ran with 1345 4-person teams. Some well-known Canadians were running for European teams: Emily Kemp ran the anchor for Angelniemen Ankkuri (team 46) which placed 20th (she will also be running for the Ottawa team!) and Louise Oram ran anchor for Bäkkelagets SK 2 (team 365) which placed 60th. Amazing performances! Canadian JWOC athlete Jan Erik Naess was recently training in Hamilton before he heads over to Europe to get ready to compete at the Junior World Orienteering Championships in Switzerland July 9-15. Click on the image below to go to Jan Erik's personal blog and read about his recent training in Hamilton. 2016 High Performance Program Silent Auction at the Canadian Orienteering Championships! While the Canadian Orienteering Championships (COCs) are still 6 weeks away, we wanted to let everyone know that the High Performance Program Silent Auction will be held in conjunction with the COC banquet on Sunday, July 31st. This is the main fundraiser each year for the High Performance Program. The last few years we have brought in around $4000! The money goes directly towards support athletes, such as through helping with training camps and having coaches. Donations from the general orienteering community (and their networks) are very welcome, so we thank you for your consideration and generosity! If you aren’t coming to the COCs, you can arrange to send your item with someone who is (who’s attending is listed here). · Can your club donate an entry to an upcoming event? · Are you a crafter – can you donate something like a pair of home- made mittens, hat, pottery? · Are you a foodie – can you donate a jar of home-made jam or a batch of cookies or granola? · Do you have a cabin that you could donate a gift certificate for a weekend or a week’s stay at? · Are you an artist – do you have a sketch of an orienteering scene, or a great photograph that you could put in a frame? · Could you ask your local running/sport store to donate an item? · Any other skills that you could offer to help coach someone in? If you have any questions, please email Emily Ross at emily.s.r@gmail.com. Please let her know if you are planning on bringing something so we can start to get a sense of what items will be donated as well as start hyping some of the big ticket items. Thank you for all of your support of the High Performance Program and we look forward to seeing you at the Icefields Parkway Orienteering Festival! Just a few weeks are left before the JWOC training camp and JWOC in Scuol, Switzerland. The teams members are busy training for peak performance July 9-15! The team this year has a mix of JWOC veterans and some new faces, with first-time JWOC coach Jeff Teutsch at the helm. Sabine Schweiger is the team leader. Erik Blake (that's me) will be keeping you up to date, and assisting Sabine. If you want to follow what's happening, you can go to the JWOC web site at www.jwoc2016.ch. We'll be updating you on the athletes' progress for each race, so stay tuned to this blog. I'll also be posting on twitter with the hashtag #jwoc2016can - I invite others to do so too!